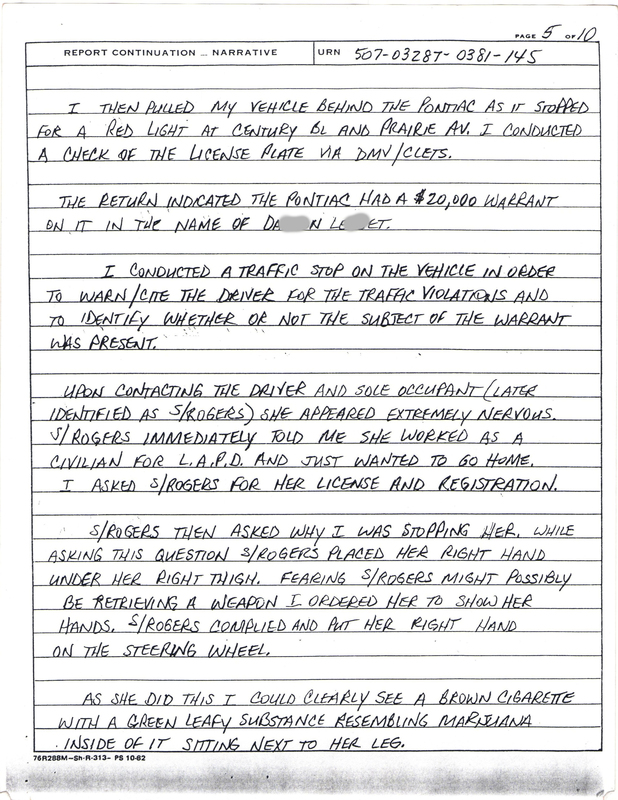 This is the arrest report written by Los Angeles Sheriff’s Detective/Deputy (Lennox Division) Christopher Maurizi the night of the False Arrest, April 6, 2007. Keep in mind that after 3 trials, his testimony under oath has changed multiple times. 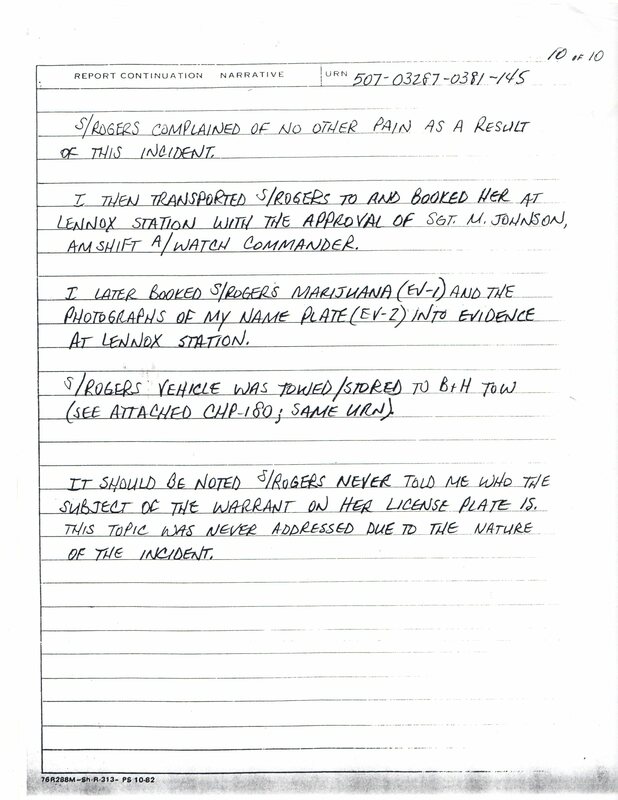 He even admitted that a lot of what he wrote in his arrest report that night is no longer what actually happened. He spent his time on the witness stand explaining to the court why this happened. So REMEMBER when reading this arrest report, it is not the same as what Maurizi testified to. Deputy Maurizi does not seem to write accurate reports to be relied upon for future use. He will add/subtract or do whatever it takes to save himself from being exposed as a crooked deputy………….But it’s not much he can do to save himself from that at this point. Oh it should be noted: Deputy Maurizi testified in court that he did not have his citation book with him upon the traffic stop. He said he usually kept it inside his trunk in his duffel bag. 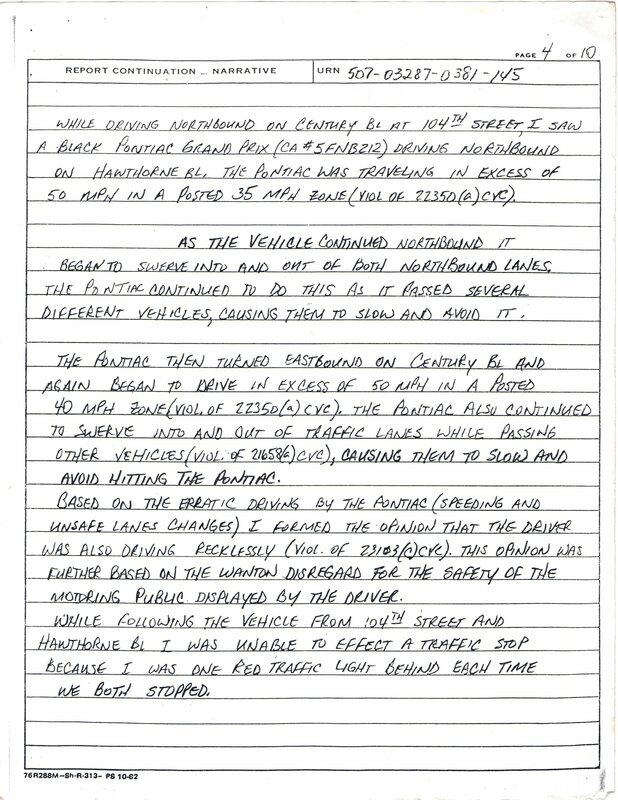 So with that information given, one can only see his intent was not to simply write a ticket that night but to make an arrest BY ANY MEANS NECESSARY. omg! im sorry you went thru that sister. Thanks for reading about my Nightmare experience! I wouldn’t wish this type of abuse/conduct on anyone! 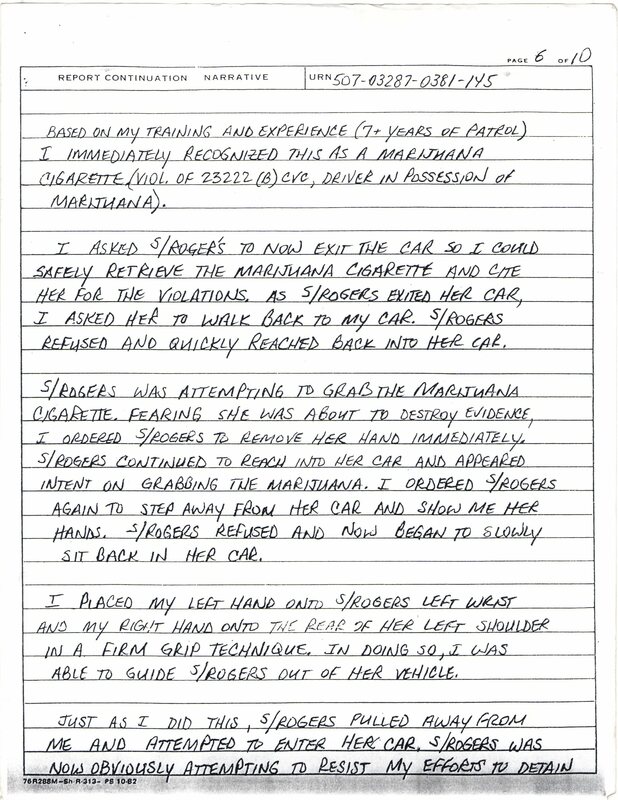 This report is typical of what officers are trained to write. It is obvious that the report was written a considerable time after the fact and with the intent of creating a ‘story.’ He lied…and all cops lie. If their lips are moving, then they are lying. Unfortunately, juries – and citizens at large – are brainwashed into believing that pigs are exemplars of character. Rubbish. Law enforcement is the largest criminal enterprise in the country. It is much more likely that the pig that stopped you was hoping to get your number. It happens routinely. If you get the chance, read “Enemy in the Streets,” by Ed Cray. And the next time you’re stopped, contact attorney B. Kwaku Duren on 47th and Crenshaw. He’s a former Panther and schooled on police abuse. Thank you for taking the time to read this ‘Report of Lies.’ You are so right about officers being trained to lie & this one proved us right! I’m going to look into that book, thanks!! Oh, and hopefully I won’t be stopped again, but YEAH RIGHT, I never know what might occur out here in these streets…..
You sound GUILTY as charged!